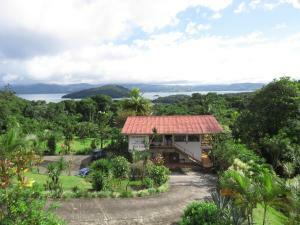 ﻿ Best Price on Lucky Bug Bed And Breakfast in Nuevo Arenal + Reviews! Providing a garden and free WiFi, Lucky Bug Bed And Breakfast provides accommodations in Nuevo Arenal. There's also a kitchenette in some of the units equipped with a microwave, a toaster, and a fridge. A continental breakfast is available daily at the property. At the bed and breakfast you'll find a restaurant serving German cuisine. Gluten-free, vegan and vegetarian options can also be requested. Lucky Bug Bed And Breakfast has a terrace. A car rental service is available at this property. Fortuna is 30 miles from the accommodation. The nearest airport is Liberia Airport, 59 miles from Lucky Bug Bed And Breakfast. A prepayment deposit via Pay Pal is required to secure your reservation. The property will contact you after you book to provide any instructions. Payment before arrival by bank transfer is required. The property will contact you after you book to provide instructions. Please inform Lucky Bug Bed And Breakfast of your expected arrival time in advance. You can use the Special Requests box when booking, or contact the property directly using the contact details in your confirmation.